This soft and cool feeling tee makes a great gift for the person who likes Humorous Tees or Funny Tees. 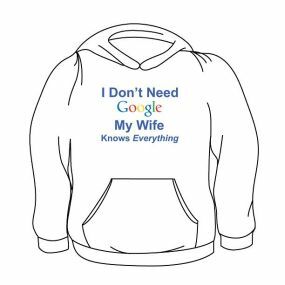 All of our Novelty T-Shirts and Funny Tees within our Humorous Tees section as well as our No Google My Wife Knows Everything Hoodies are first quality hoodies made from a 50/50 cotton-poly blend. Every one of our humorous novelty tees are incredibly comfortable and are made to last. This No Google My Wife Knows Everything T-Shirt comes in your choice of the colors shown and in men's sizes from S to XL. 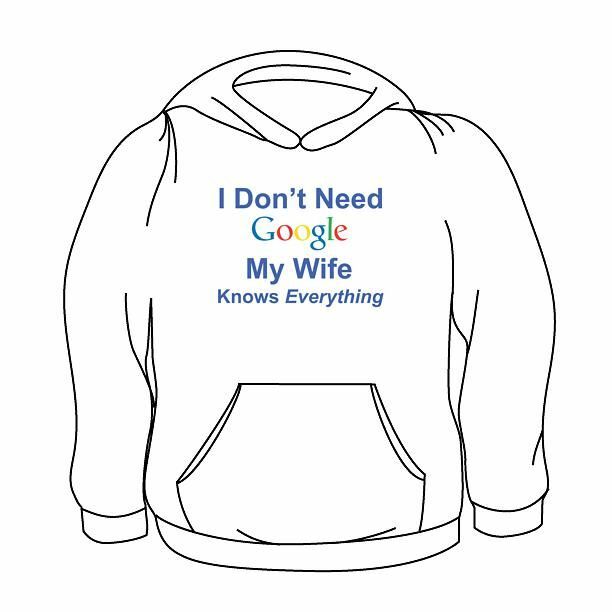 If you have any questions or suggestions regarding our No Google My Wife Knows Everything Hoodie or any of our other Novelty T-Shirts within our Funny Tees section or the Humorous Tees group, feel free to send us an e-mail and include the product name and number.